Durban Poison is the perfect strain to help you stay productive through a busy day, when exploring the outdoors, or to lend a spark of creativity. This pure sativa strain originates from the South African port city of Durban. It has gained notoriety worldwide for its sweet smell and energetic, uplifting effects. Growers and concentrate enthusiasts will both enjoy the over-sized resin glands which make this strain a quality choice for concentrate extraction. The buds are round and chunky, and leave a thick coating of trichomes on almost all areas of the plant. 8 reviews for "Happy Face – Durban Poison – Sativa – Vape Pen"
I am so so glad I bought this. I had a smile come on pretty quick on only one puff! I also am impressed by the amount of puffs I’ve gotten…over 150 so far and there’s still a little left for an emergency. My lungs feel free and I never cough with this device. It needs no lighter or matches to light up, just a good inhale and it immediately delivers product. 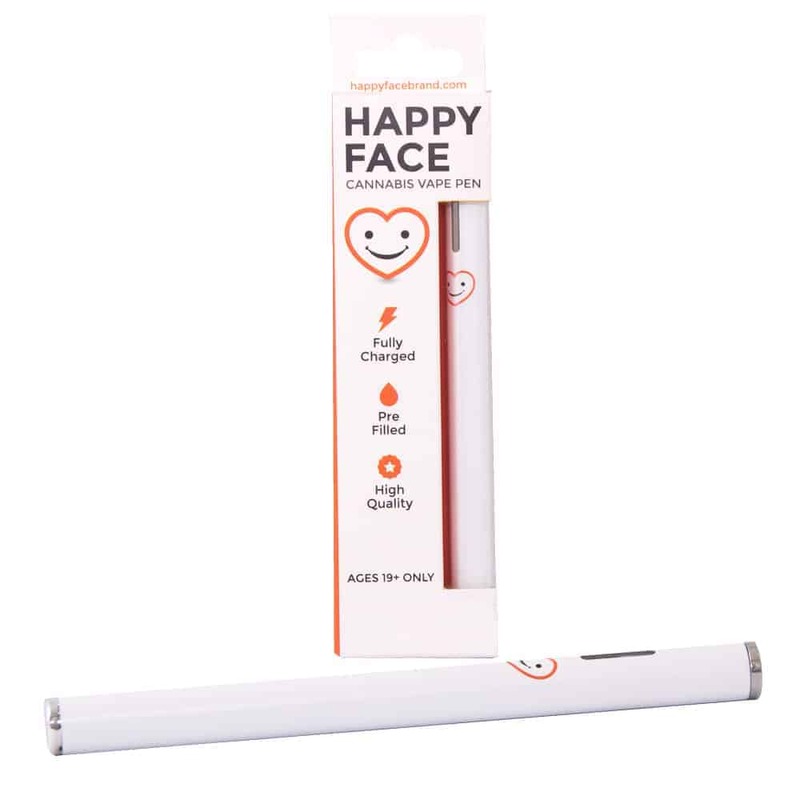 Happy Face Vap Pen gives me a great positive mental energy that lasts me about 3 to 4 hours. Pen design is small and discrete with little smoke odour. I can keep in provided small box in my purse and there is no smell and can reuse pen easily the next time I need to motivate my productive uplifting mental energy I will buy again. Great for the discreet smoker. …..The Sativa gummies are also great with same productive and creative energy. Each gummy I cut into 3 to 4 uses so all 4 gummies last a long time, and taste quality excellent. I just keep remainding gummies in a discreet zip-lock baggie in my fridge, or could even keep in secure tamper proof container, sealed from air to keep soft. The mail order couldn’t be easier, discreetly double packaged in confidential packaging. Got 3 days in my mailbox from processing easy debit pay secure transaction. Glad to have the Happy face wrinkles ironed out. The sputtering of the old model was frustrating. Nice little buzz on one hit, mild and very easy on the throat. Few hits puts you in the happy place! Mild and mellow! Handy, taste good lasted me over a week.